Why Medicaid Cuts Would Likely Widen Quality Gaps In Nursing Home Care : Shots - Health News Medicaid covers about two-thirds of nursing home residents across the U.S., and pays significantly less than other types of insurance, including Medicare. Nursing homes that rely the most on Medicaid tend to provide the worst care for their residents — not just the people covered by the program but also those who pay privately or have Medicare coverage. Despite the collapse of the latest Senate effort to repeal the Affordable Care Act, congressional Republicans are still keen on shrinking the amount of Medicaid money Washington sends states. Down the line, this would create problems for the nation's 1.4 million nursing home residents — two-thirds of whom are covered by the state-federal health care program for people with low incomes or those with disabilities. Medicaid already pays less than other forms of insurance. As a result, nursing homes make more than 10 percent on Medicare residents, but lose about 2 percent on the rest of their residents because so many have care paid for by Medicaid. If the feared reductions in federal funding come to fruition, states would likely respond by either lowering their payment rates or restricting whom they cover and for how long. And the quality of care, experts say, would deteriorate further. Three charts, based on a Kaiser Health News analysis of ratings from the federal government's Nursing Home Compare website, illustrate how care suffers in nursing homes where Medicaid is the dominant payer for residents. The government rates nursing homes on a scale from one to five stars, based on overall quality. The factors weighed are: how well each facility performs on government inspections, how many nurses and aides it employs and how healthy its residents are, as judged by such measures as how often they fall, get infections or are admitted to the hospital. The first chart below shows the big picture: Nursing homes with higher percentages of residents covered by Medicaid earn fewer stars on the federal government's overall quality rating system. One-star facilities (lowest quality) average 69 percent of residents on Medicaid; Five-star (highest quality) average 49 percent of residents on Medicaid. A prime reason for the disparity, researchers have found, is that nursing homes with the most Medicaid residents can't afford as many nurses and aides. Medicare assigns a second type of star rating that represents staffing levels and is based on the ratio of nurses to residents. As the second chart shows, the staffing differences are huge: The average five-star home has enough nurses and aides to provide 5.4 hours of care a day for each resident, while the average one-star home provides 3.0 hours of daily care per resident. At the best-staffed homes (five stars), only 4 of 10 residents are on Medicaid, meaning the remainder of residents are more lucrative for those facilities. At the worst-staffed homes (one star), 7 of 10 residents are on Medicaid. Low staffing is just one factor behind inferior quality ratings for homes that rely heavily on Medicaid, says Dr. David Gifford, senior vice president for quality and regulatory affairs at the American Health Care Association, a nursing home trade group. A facility's ability to buy medical equipment, medications and oxygen and to keep the building operating can also suffer. The government publishes a third set of stars representing the results of health inspections. State inspectors give citations to nursing homes that don't protect residents from bed sores, accidents, infections and other types of harm. Our third chart shows how facilities with more health violations usually also have more Medicaid beds. At nursing homes with worst inspection records (one star), an average 65 percent of residents are on Medicaid. Places with the best inspection records (five stars) have an average 47 percent of residents on Medicaid. "It's very likely that if Medicaid payment rates freeze or decline, there would be adverse effects," says Vincent Mor, a professor of health services, policy and practice at the Brown University School of Public Health. "Nursing homes that can, will get out of the Medicaid business if it's at all possible. Those that can't will try to keep their beds as full as possible and live with a negative margin — and reduce food, reduce staff and try to struggle along." Mor says the Medicaid cuts might not even save the government money in the end. 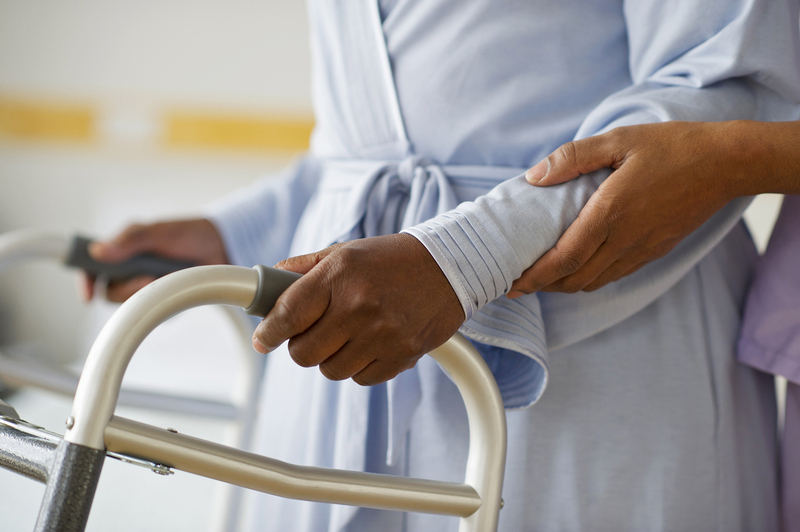 "When Medicaid nursing homes are poor and perform poorly, their hospitalization rate increases, and Medicare pays for those hospitalizations," he says. "If I'm a nursing home and I can barely afford my patients, I'm going to send my patients to the hospital." Kaiser Health News, a nonprofit health newsroom, is an editorially independent part of the Kaiser Family Foundation. This story is part of a periodic series — Medicaid Nation — KHN's look at how Medicaid affects the lives of millions of Americans.